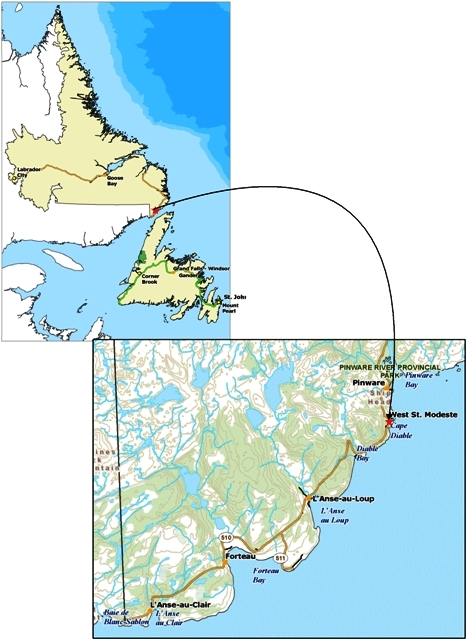 There are nearly 5000 recorded archaeological sites in Newfoundland and Labrador. 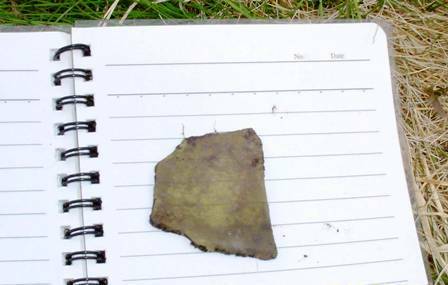 They range in size from large precontact Aboriginal sites like Port au Choix or Nulliak Cove to very small spot finds of just an artifact or two. There are huge European sites like those at L’anse aux Meadows, Red Bay or Ferryland and smaller European sites that consist of just a house foundation. Some of these sites are very well known in the public sphere others are completely unknown. The first site we’ll look at is a possible French establishment in West St. Modeste, Labrador known as Old French Fort EjBe-60. The Labrador Straits area of the Province has a long history of both Aboriginal and European occupation. No where is this seen better than in the area around the communities of West St. Modeste and Pinware. 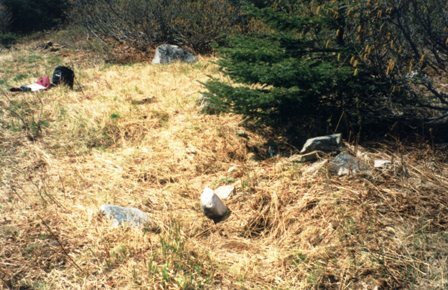 In terms of Aboriginal archaeology sites these two communities host the oldest known precontact Aboriginal sites in Labrador. But those will be dealt with in another post. The European occupation in this area likely goes back to the early 1500s with various migratory fishermen using the area. By the 1560s the area around West St. Modeste was a Basque whaling station known as San Madet or Semedet. Some of this early Basque material still exists as recognized archaeological sites. But the focus of the post today is a site that is a little younger. 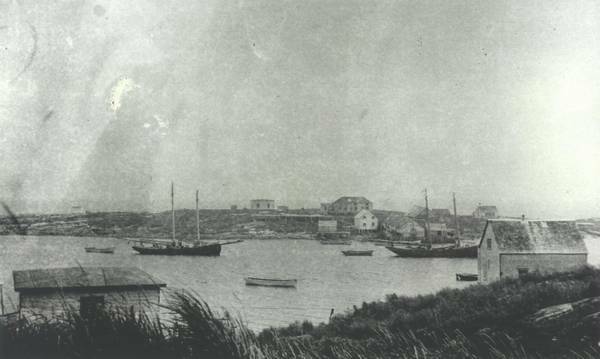 Pierre Constantin’s first land grant in the Strait of Belle Isle first occurred in 1713. By that time he had 13 years of experience working in the Strait of Belle Isle area. By 1716 he received a grant for life, of land on either side of the Pinware River. The remains of a structure within the community of West St. Modeste were briefly visited by two archaeologists in 1999. This was just a cursory visit with photos taken confirming the existence of something the local folks have known about for years and refer to as the Old French Fort. At that time they were able to confirm that the site consists of a series of depressions from the structures and a few rocks sticking through the soil. They also confirmed the site had been looted; an activity which is illegal in this province: Historic Resources Act. Most likely the looters were looking for artifacts or were just curious as to what exactly the mounds in the ground were. Unfortunately, their curiosity destroyed the context of the area in which they were digging. People think that archaeology is all about the artifacts. But the reality is that archaeologists are more interested in the artifacts context; was the artifact inside a building or outside, how deep was it in the ground, what other artifacts were found nearby? It is this data that archaeologists are after and the reason why we painstakingly measure the the position of each artifact we find, down to the nearest centimetre. The site was briefly revisited in 2003 and 2005 with some test pitting done in 2005 to try to recover some artifacts in order to confirm the age and exactly who occupied the site. Five test pits (TP) were dug that were thought to be inside or very near the Fort. 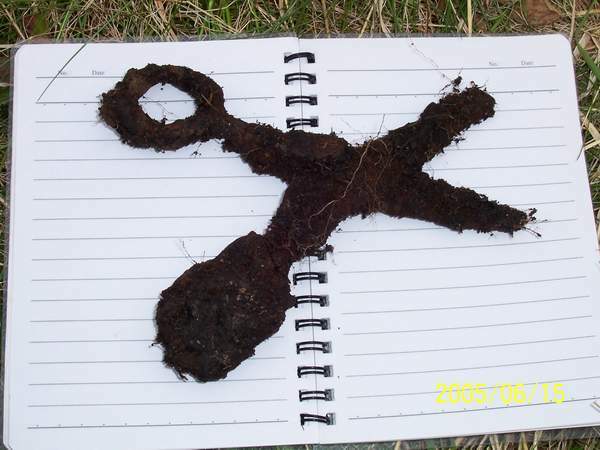 TP 4 contained coal and a pit or seed possibly from some form of fruit such as a plum. 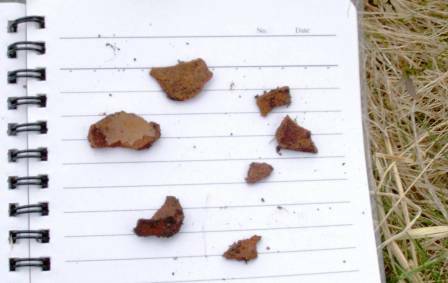 TP2 contained several red brick fragments and some iron fragments. TP1 several metres away from the Fort contained the most material we found in any test pit. It included a gun flint, a rusted pair of scissors, coarse earthen ware (CEW) with orange fabric and a yellow glaze on the inside, 20-25 pieces of iron, a kaolin pipe stem and bowl fragment, a piece of possible case bottle glass, burnt glass and burnt bone and a few other pieces of ceramic. An historic archaeologist who looked at just the photos stated that the CEW looked similar to material she had seen on other French sites and that the fragment of possible case bottle glass did indeed look like case bottle glass to her. Case bottle glass was popular through the 17th century and into the 18th century. So the brief testing done on the site in 2005 didn’t confirm that the structure was built by Constantin but it certainly added weight to the likelihood that it was part of Constantin’s establishment at Seigneurie du Grand St. Modet in the early 18th century. Great to see this! Can’t wait to see what else comes out of the files. Thanks Tim – I’m looking forward to seeing what comes out as well. Excellent idea, and great post! Glad to see this blog. Very interesting site. Thanks for the post. Hey Steve, the blog looks great! You mention that you would like to highlight sites “on a regular basis” — Are you planning scheduled updates (e.g. one per month?) or are the posts more likely to be sporadic based around your other work? By the way, congrats on getting out Volume 9 of the PAO Archaeology Review. Great job as usual! Thanks John, I am hoping to do a blog update every other week. We’ll see if work allows me to do this. Great idea about the blog and an interesting initial posting. You asked about photos from some of the sites we have worked. Why not invite guest blogs. You could think of some categories and invite folks to submit short accounts, almost mini-site reports but from a more personal or informal perspective. Another category might be accounts of specific artifacts, little biographies on some of the odds and ends that people have come across in the careers. So much of the drama and joy and excitement of doing archaeology is lost by the time it appears in a publicaition, it would be nice to have an outlet for those stories. Anyway, this looks like it will be fun. The idea of a guest blogger was an idea I had thought about, I’m not entirely sure how that would work. I assume the guest would write something and I would have to reformat it to fit. Obviously I’ll have to iron out the methodology but it is an idea I am considering. Are you volunteering to be the first guest? The website that I got the photos from no longer has the photo on line. I can’t tell you the age of the photo.